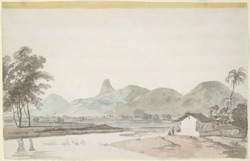 Pencil and wash drawing by Thomas (1749-1840) and William Daniell (1769-1837) of a scene, possibly near Cotumba in South India, dated c.1792. The image is inscribed on the back in ink: 'Nr 68. Near Cotumba:' in pencil: 'No 61.' This drawing might represent Cottumpallee, between Tiruchengodu and Namakkal, which the Daniell's passed on 30th May, 1792.